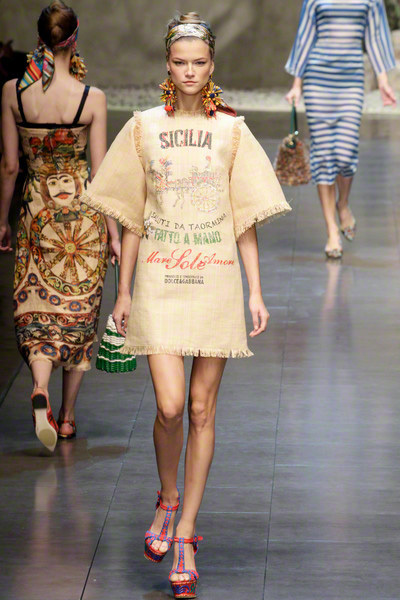 Stefano and Domenico didn’t have to travel far for the inspiration of their summer collection. 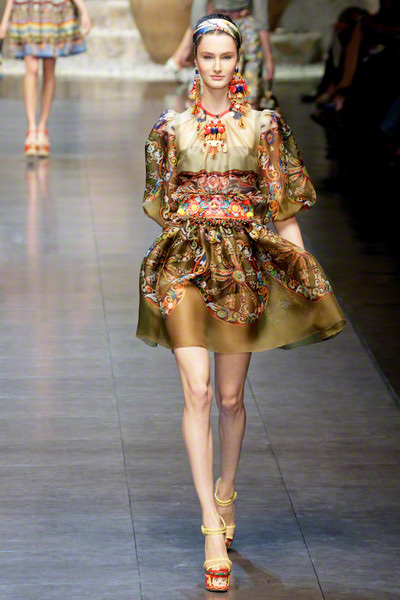 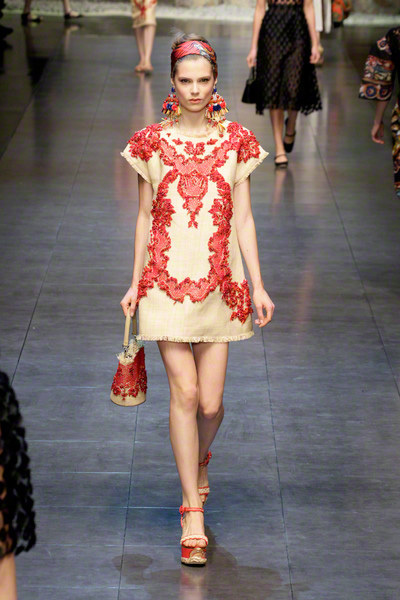 Sicilian tradition was the designers’ (Domenico has his roots on the Italian island) starting point. 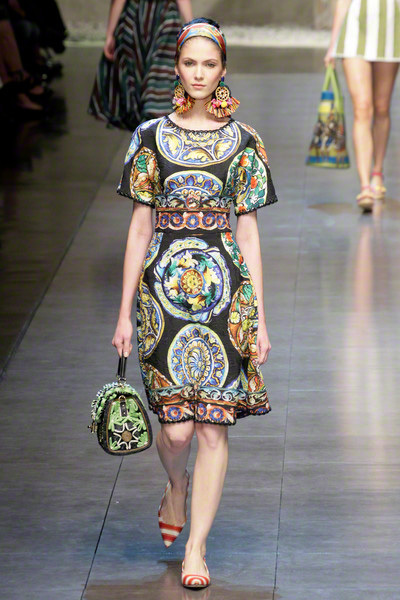 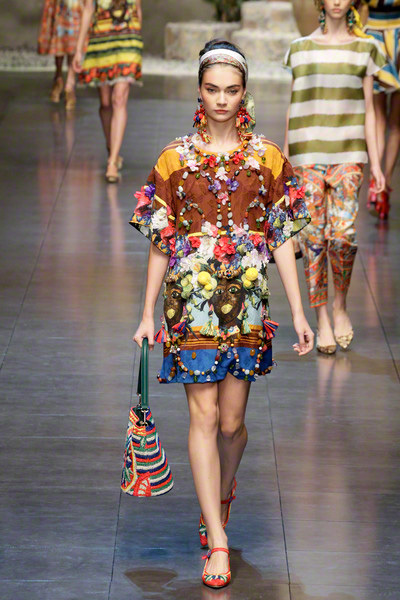 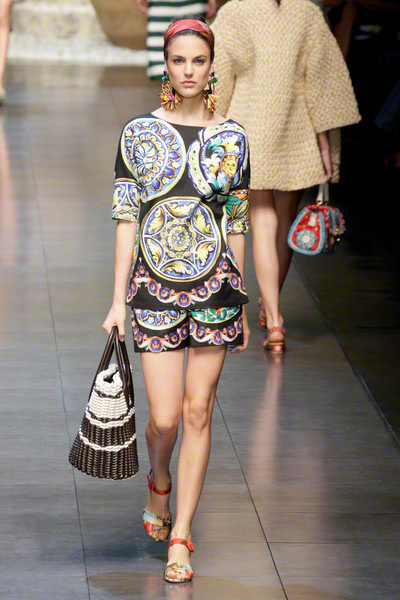 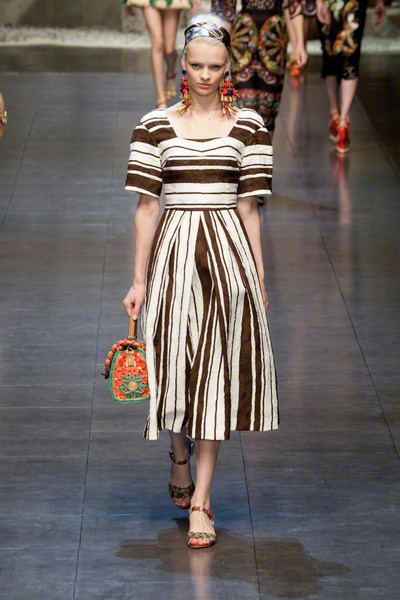 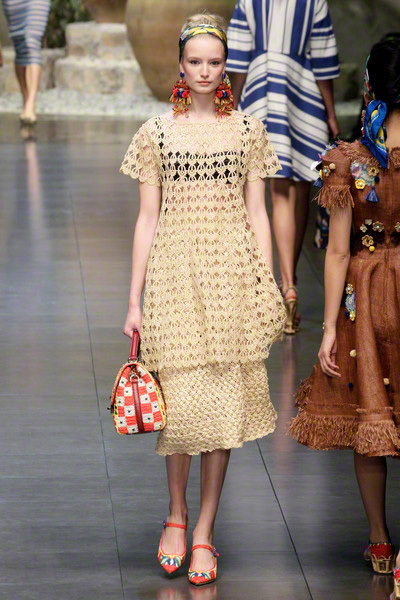 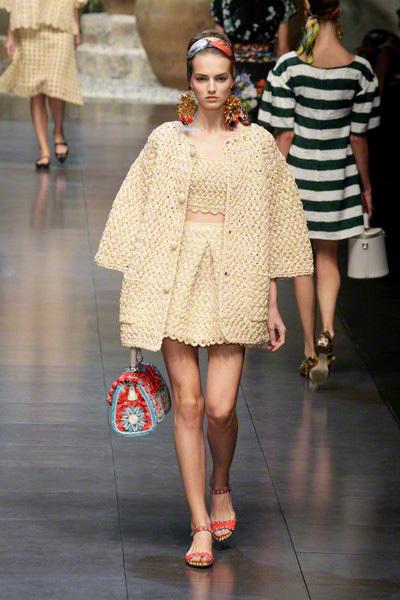 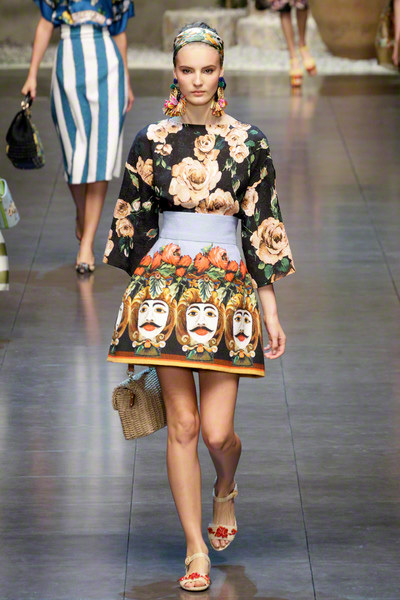 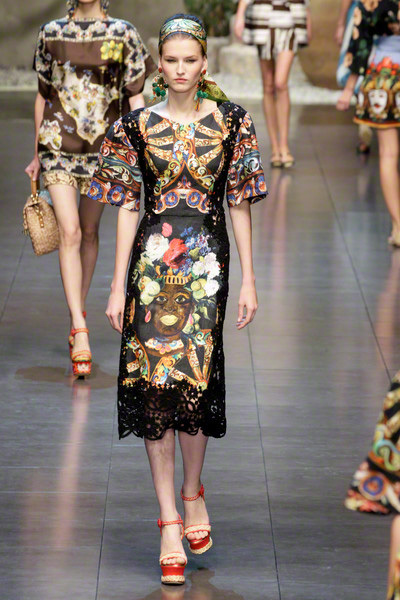 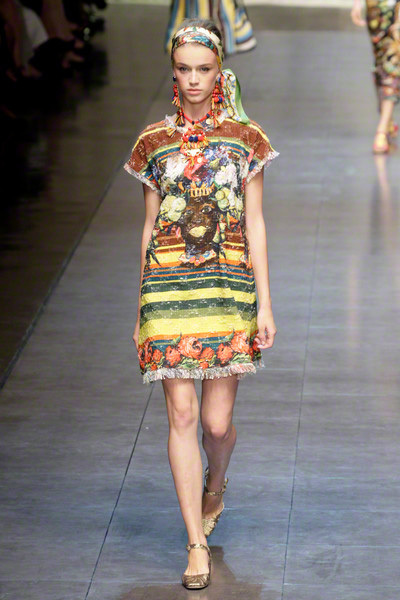 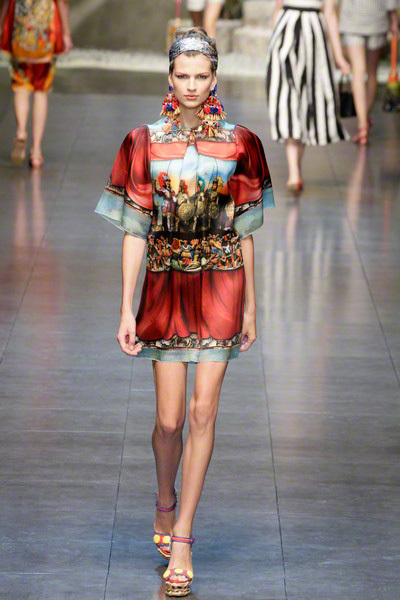 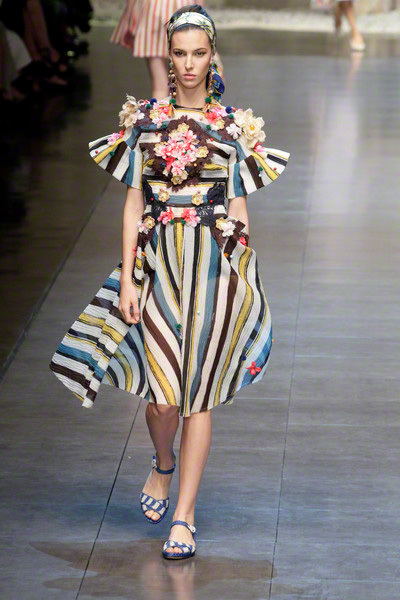 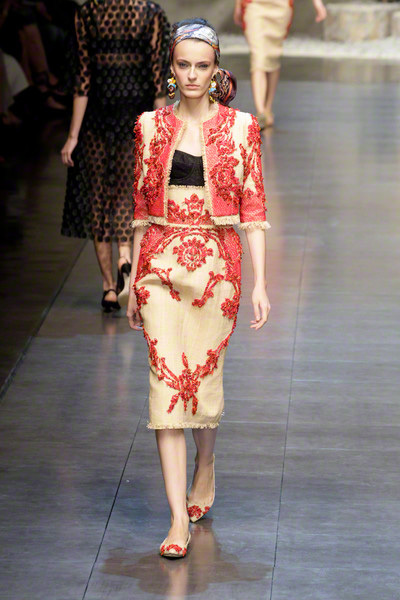 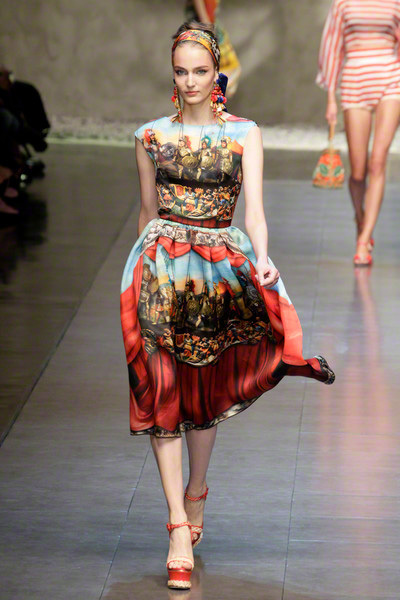 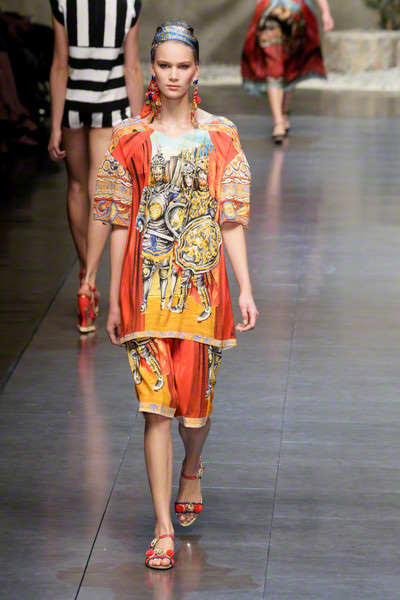 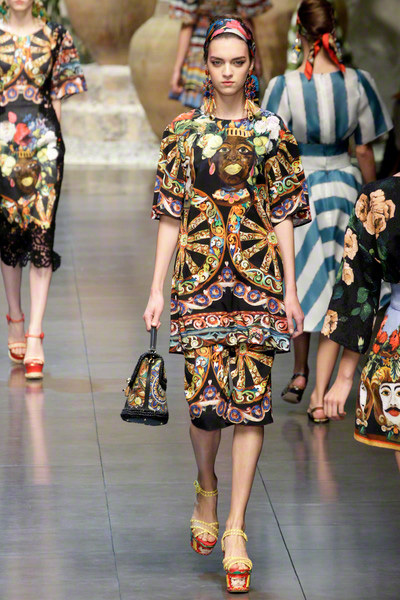 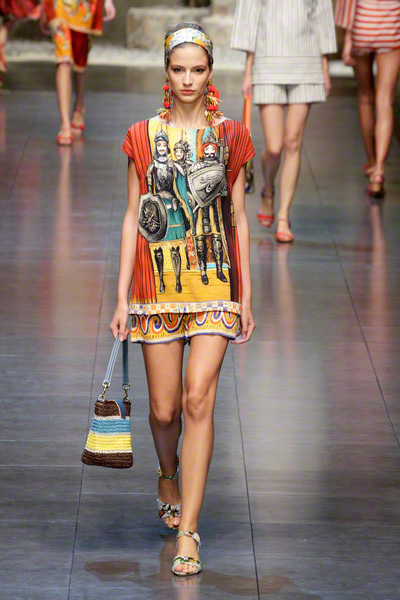 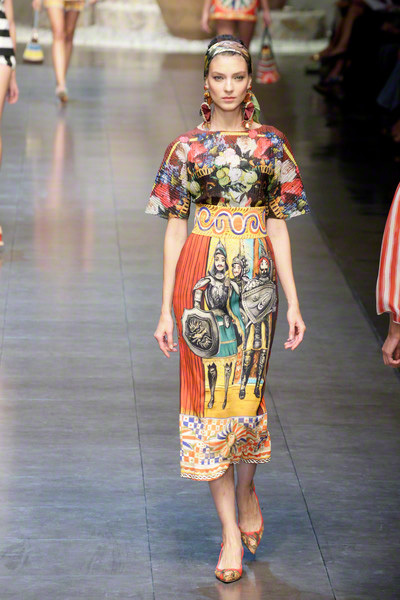 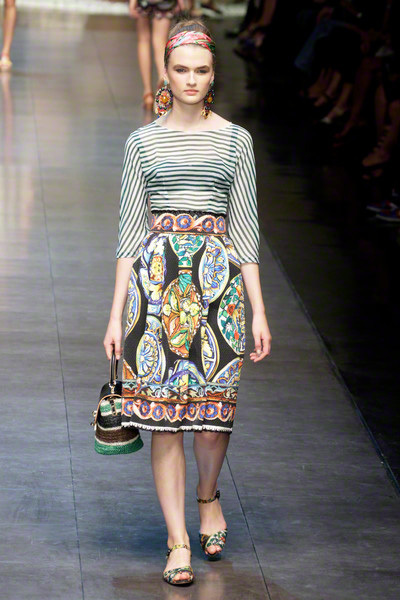 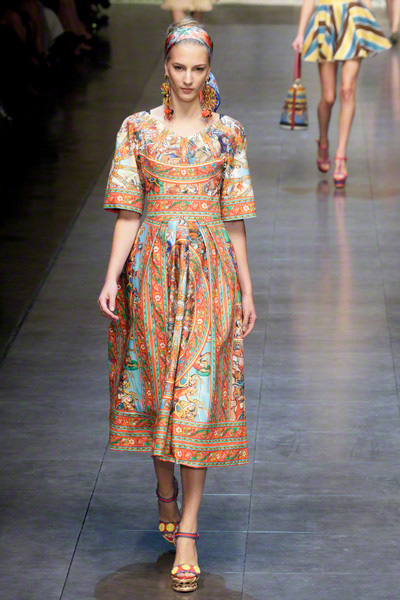 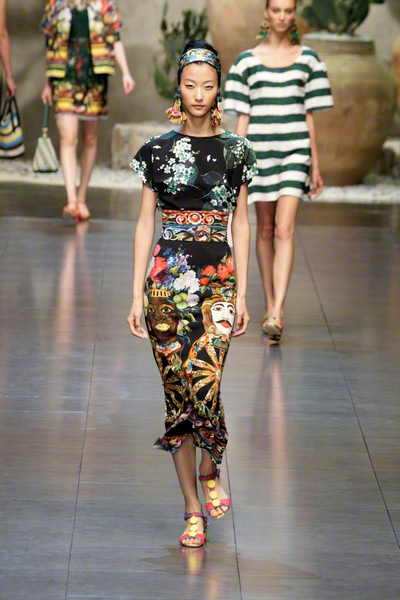 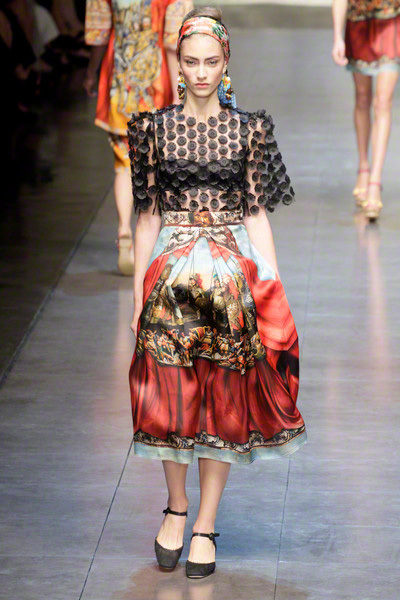 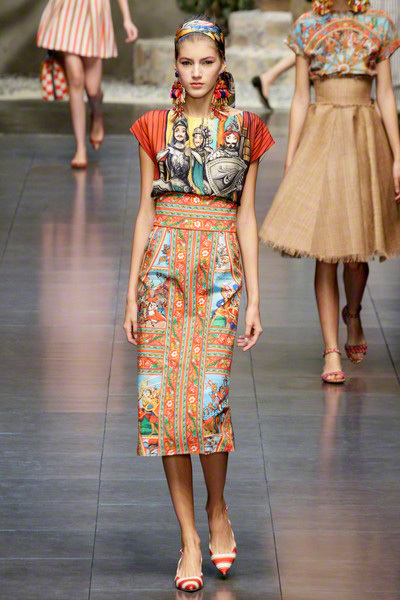 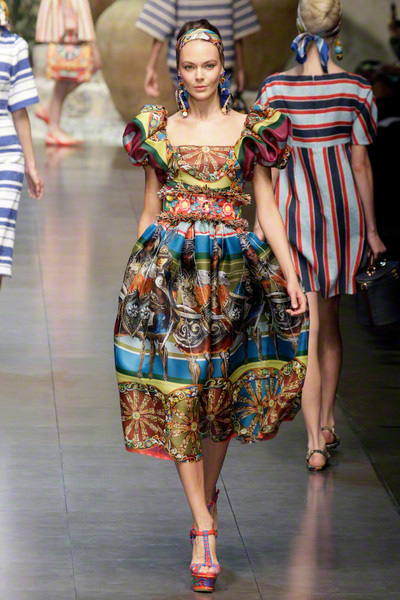 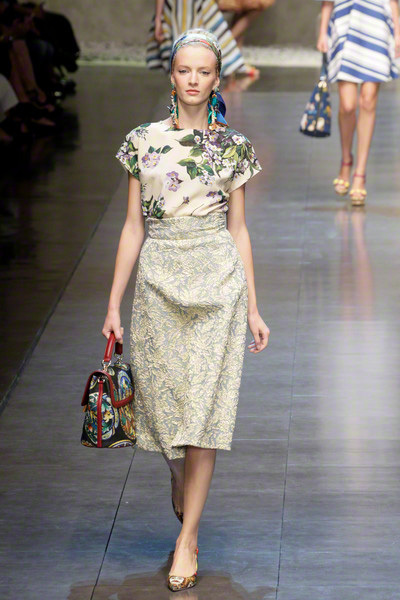 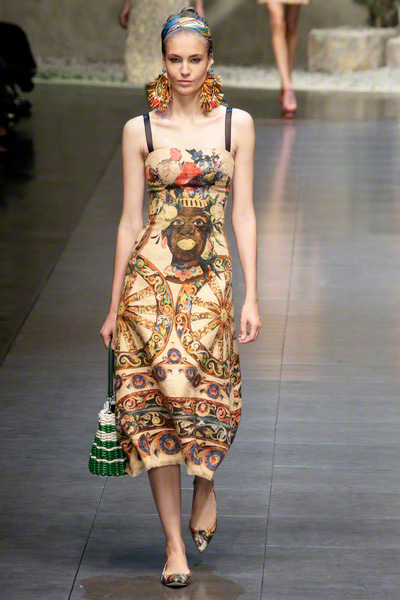 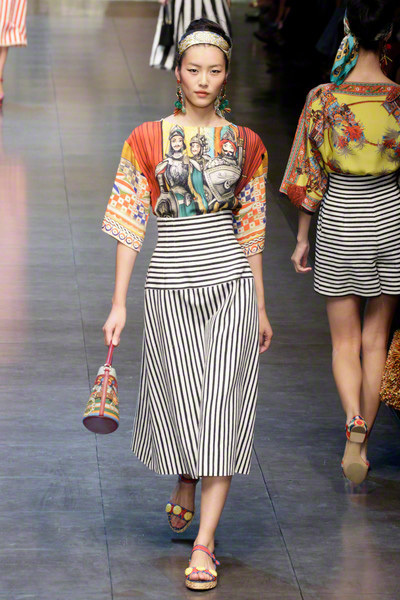 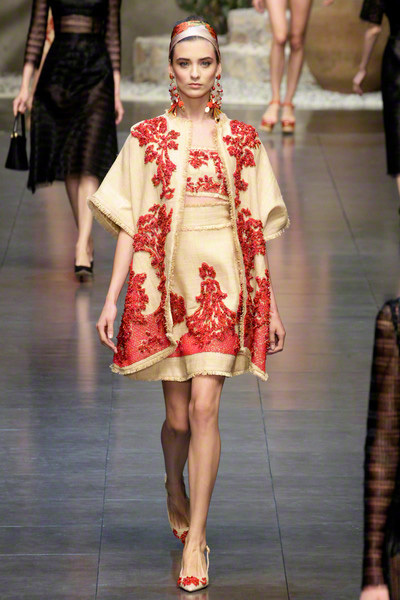 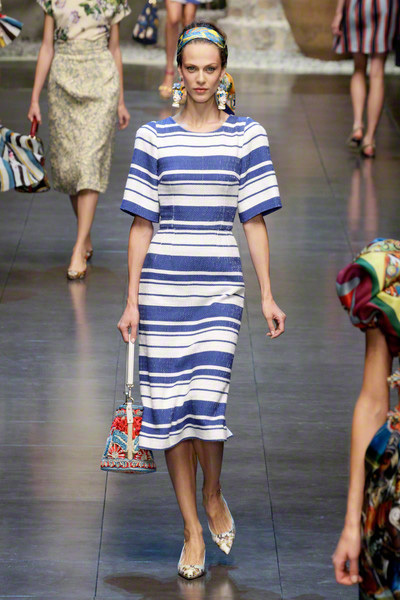 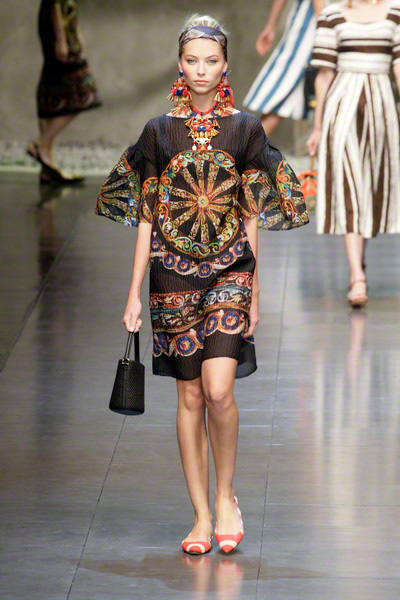 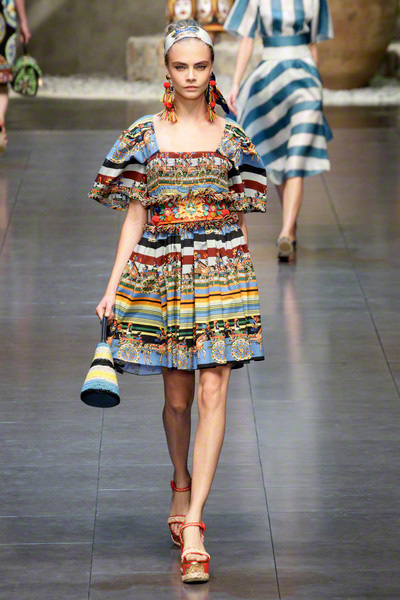 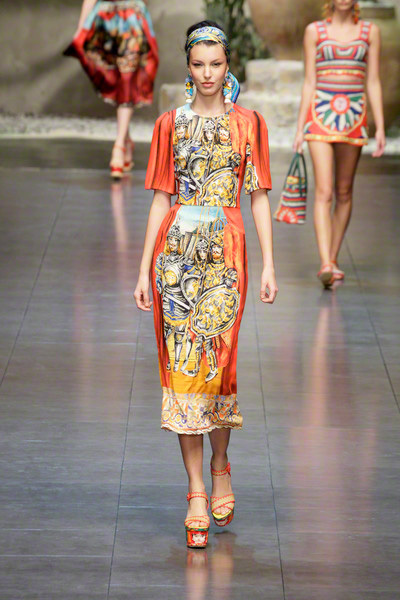 Dolce & Gabbana took their theme of choice quite literally, displaying prints of famous theater puppets and using images of Caltagirone head-shaped ceramic vases and dishes. 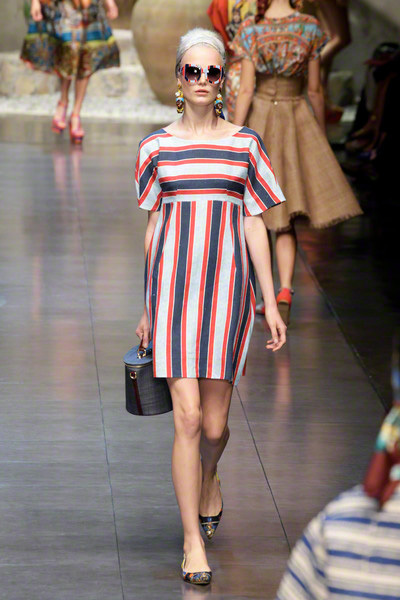 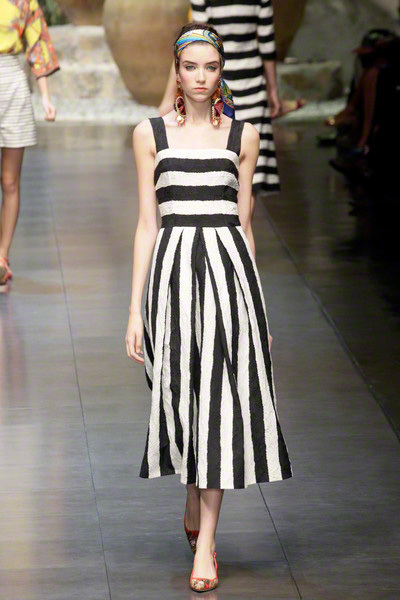 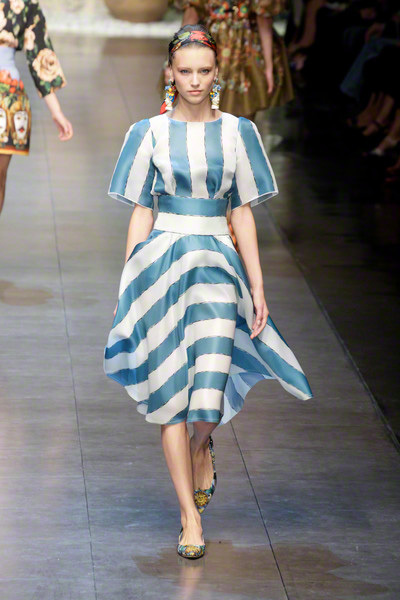 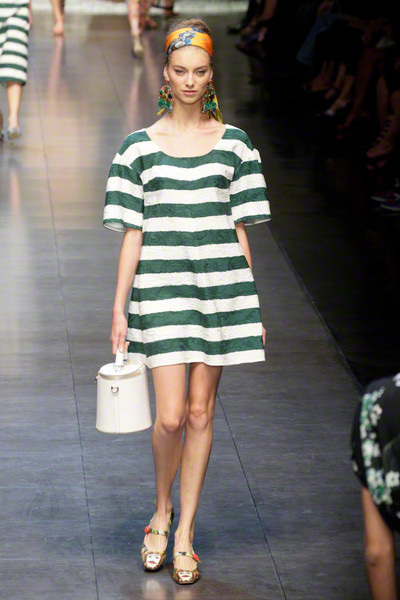 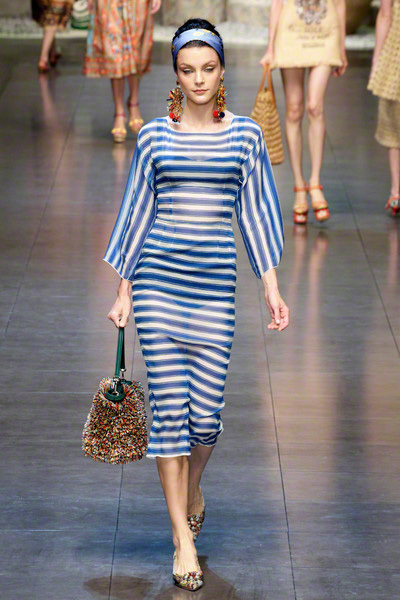 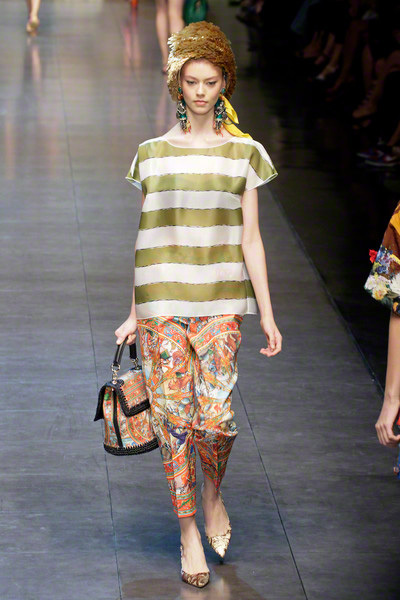 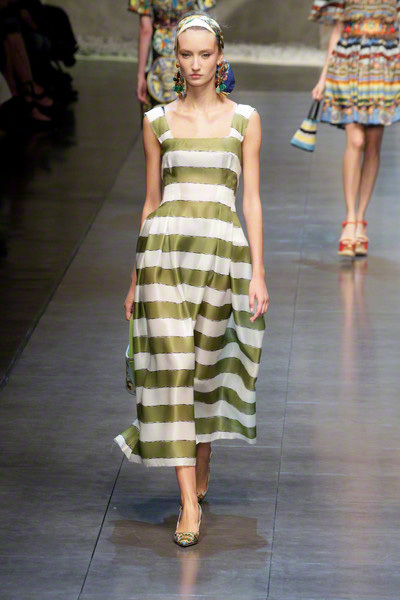 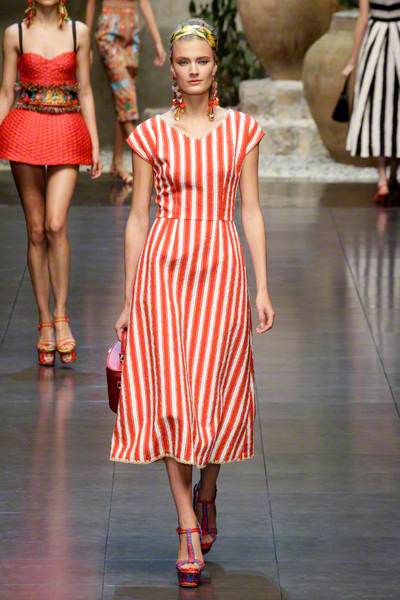 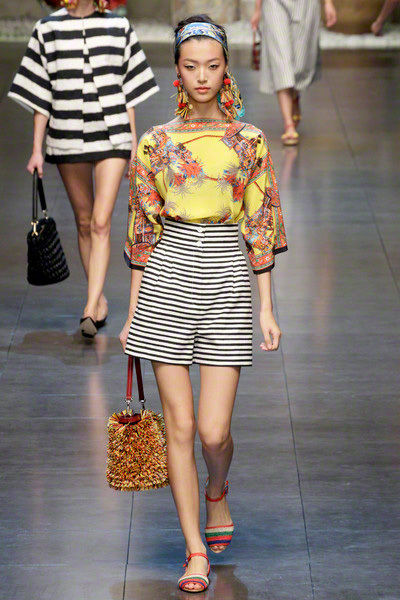 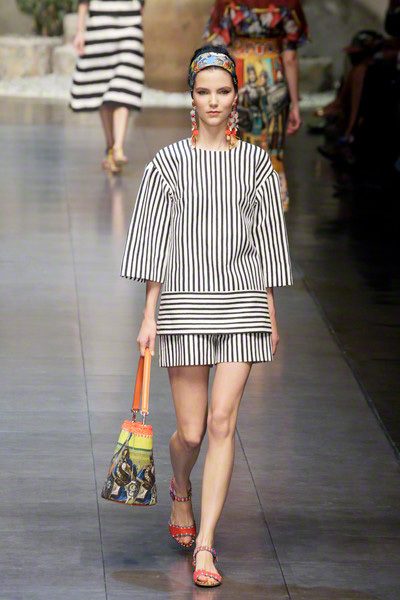 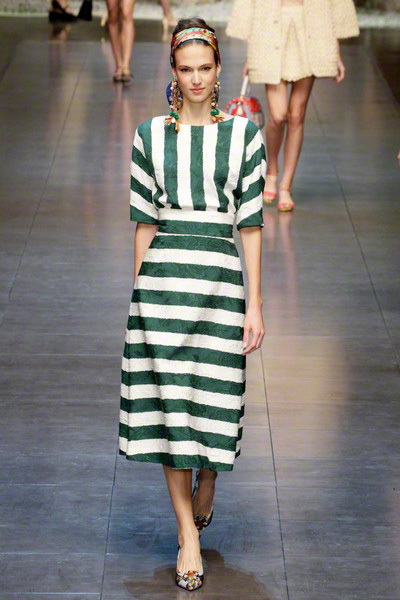 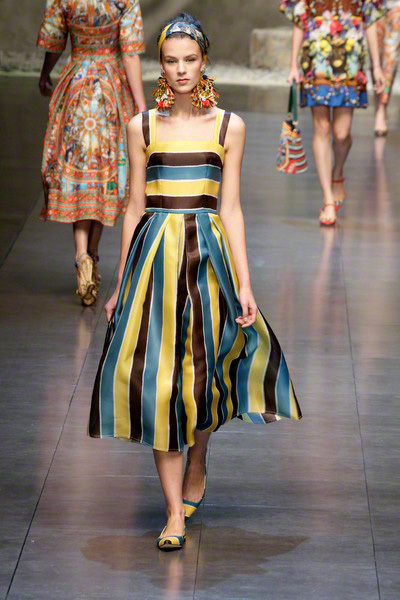 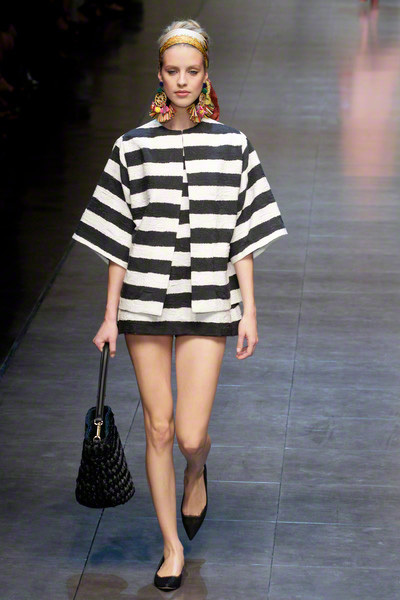 Elements which they mixed with stripes to recall the beach umbrellas and sun beds of local shores, thus creating the wardrobe for a hot summer of ’13. 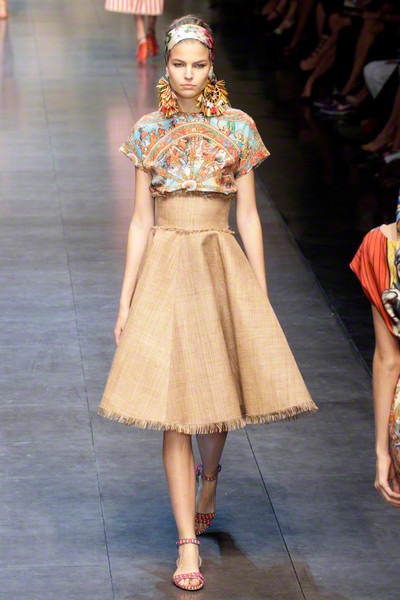 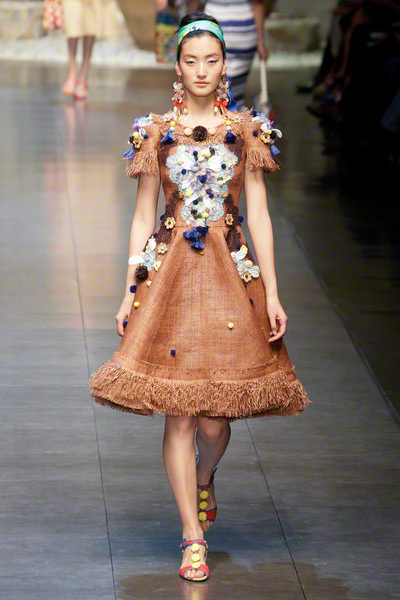 Like you’d expect from the two designers a lot of craftsmanship was put into creating the clothes using natural materials like straw, raffia, organza, cotton, linen and brocade. 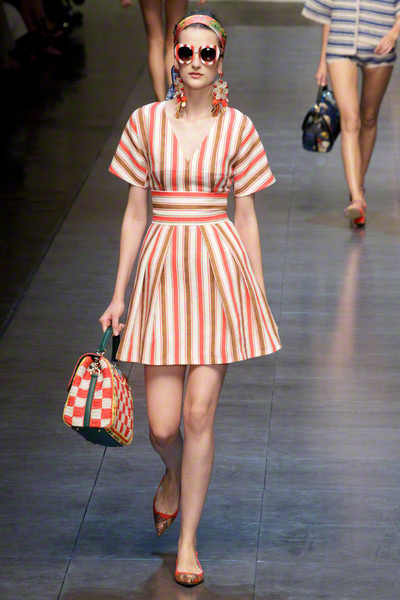 A coral colored basket-like mini dress and several midollino corsets being the ultimate example of the designers’ strive for handmade perfection. 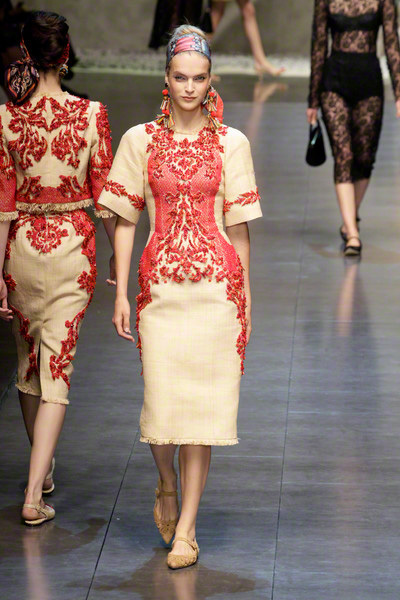 And even though materials may be rough and stiff the models looked graceful and feminine in their A shaped looks, which were all accentuated at their waists. 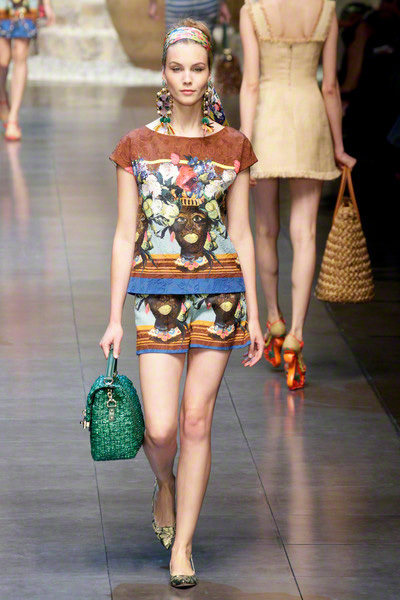 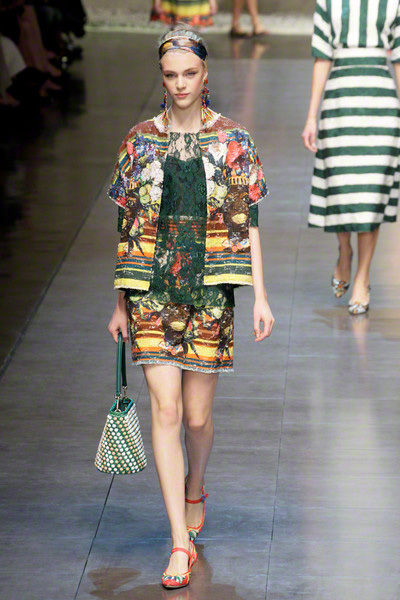 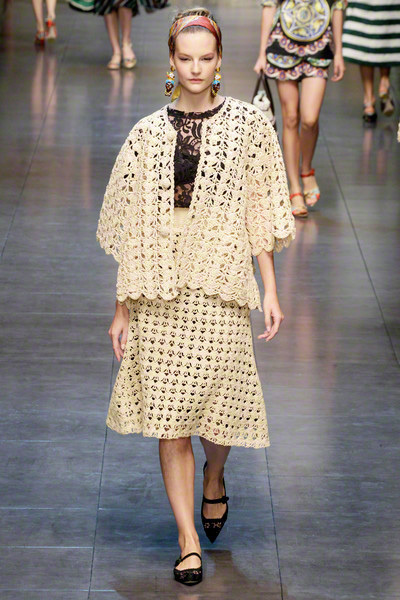 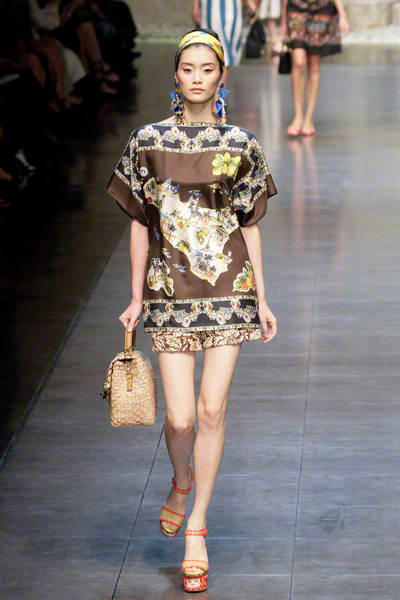 Besides presenting their new collection Dolce and Gabbana did a little promotion for ‘their’ island as well. 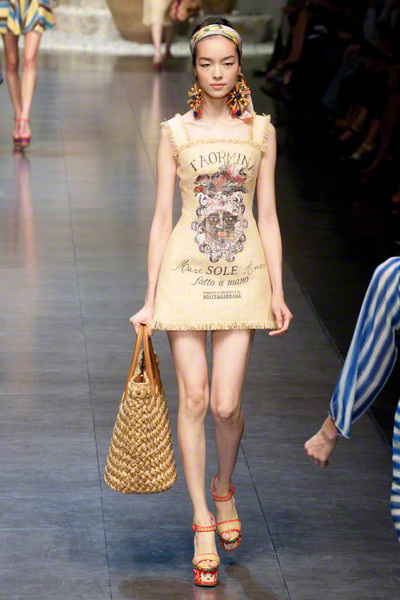 Several designs read “Hand made see, sun, love” as Domenico Modugno sang about how wonderful life actually is.